Now you can have this Do You Even Spin Bro T-Shirt that is just made for anyone that likes fidget spinners. You can get this t-shirt in many styles for men, women, and kids and it comes in sizes from kids 6 months all that way to adults 6XL and it comes in many fun colors too. 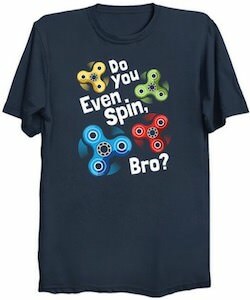 On this t-shirt you can see a bunch of spinning fidget in fun colors and around the spinners it says “Do You Even Spin, Bro?”. So maybe most people are not doing the fidget spinner thing anymore but there are still the real users of fidget spinners and if you are one of those then you just need to wear this t-shirt. We all know that mom’s like to drink wine and that is why this is a funny t-shirt. 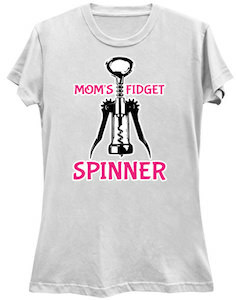 On the shirt you can see a corkscrew bottle opener and around the bottle opener it says “Mom’s Fidget Spinner”. So if you like a fun shirt to give to your mom then this could be what you need. You can get this wine bottle fidget spinner t-shirt in different styles, colors, and sizes so that it is perfect for your mom. Now you can have the normal fidget spinner and mom can have her special fidget spinner. 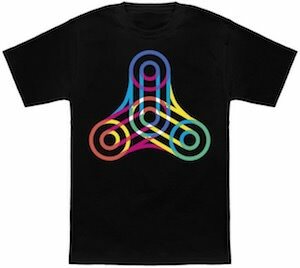 Now there is a t-shirt that shows the world how cool fidget spinners are. The shirt shows a typical 3 branch spinner but this one is made from cool colored neon lines. So now even if you don’t use your fidget spinner people will see that you are having fun with them by simply wearing the t-shirt. You can get this fidget spinner t-shirt in styles for men, women, kids and even as baby bodysuits so the whole family can enjoy wearing this cool design on its clothing. You can get the spinner shirt in many colors and sizes too so that it is just the shirt you really want to wear.